As it turns out, our anxiety about personal safety and security in Vieux Fort is unwarranted. The only threat here was the squally weather that persisted for most of the night. The anchor is up at Vieux Fort, St. Lucia at 6:45 AM on Sunday morning. 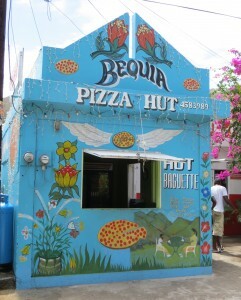 Our destination today is the small island of Bequia, about fifty miles to the south. 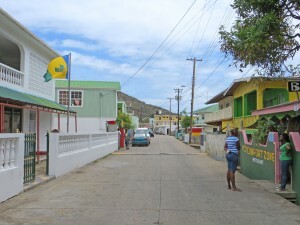 Bequia is part of the island nation known as St. Vincent and the Grenadines. The island of St. Vincent lies directly on the path to Bequia. 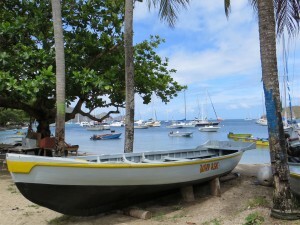 Most boats sail past St. Vincent without stopping, due largely to its tarnished reputation as a place of unfriendly behavior on the part of some residents towards yachties. For decades, stories about aggressive boat boys, dinghy theft, boat boardings and personal injury have persisted. These rumors still circulate within the cruising community. None of these warnings appear to be substantiated by fact, but who amongst us wishes to take the risk? 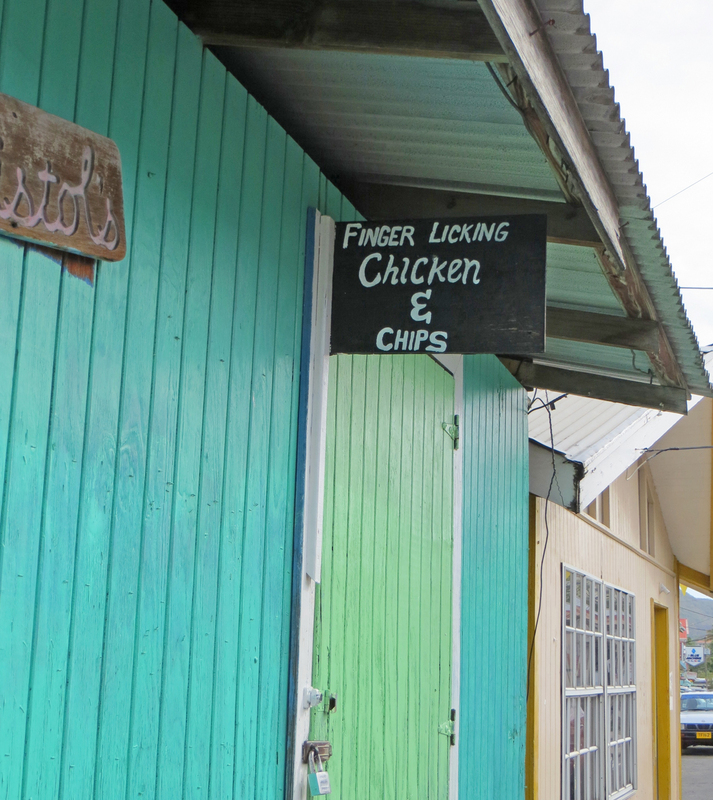 To make matters worse, the St. Vincent restaurants and shops that advertise in the Windward Island cruising guide state that they patrol their moorings and dinghy docks to insure the safety of their guests. This type of promotion further reinforces the existence of potential security problems. As a result, our intended non-stop sail to Bequia is via the windward (east) side of St. Vincent, the shortest distance to our destination. We have become accustomed to the reality that wind gusts will be highest and the sea state will be most confused at the northern and southern extremities of each island in the Windward Island chain. Today is no exception. Dark low clouds and drizzle remain from last night’s squalls, setting an ominous tone at the outset of today’s journey. To add insult to injury, a two knot adverse current is seriously impeding our progress. After an hour of battling the current, we opt instead to sail to Bequia via the leeward (west) side of St. Vincent. This change in tactics improves our speed over ground dramatically while providing a glimpse of the harbors on St. Vincent’s west coast. 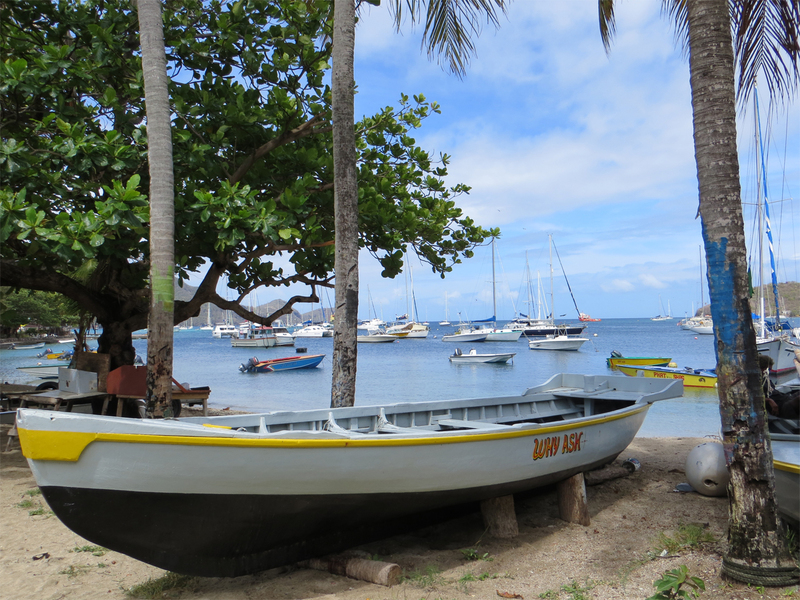 As predicted, there is not a single cruising boat at anchor in the harbors of St. Vincent today. The island is steep, green, lush and gorgeous. How frustrating it must be for local restaurants, shopkeepers and other tourist related businesses to be unable to attract visiting yachts. Hopefully, its image will someday improve to the point where cruising sailors feel comfortable calling at this beautiful tropical island. Once south of St. Vincent, it is only seven nautical miles to Bequia. 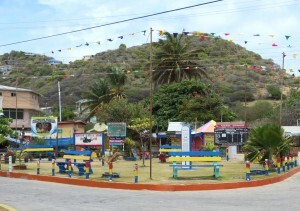 Located in Admiralty Bay, Port Elizabeth is the principal town of Bequia and an official port of clearance for customs purposes. Admiralty Bay is filled with cargo ships, ferries and cruising boats. It is reassuring to be in the company of others in the waters of St. Vincent. We opt to anchor in the less industrial part of the harbor near Tony Gibbons Beach, a decision we would later regret. A local boat boy offers us the use of a mooring, but we politely decline. We have heard that the private moorings scattered throughout the harbor are never inspected and that yachts sometimes are cast adrift from failed moorings in the middle of the night. Under these circumstances, we opt to rely upon the security provided by our 88 pound Rocna anchor. At 4:30 PM, the anchor is down just off the beach with the yellow Q flag hoisted to the spreader. We will relax aboard Cutter Loose tonight and clear customs in the morning. In the middle of the night, the wind subsides and a northerly swell materializes, seemingly out of nowhere. In the morning, Cutter Loose, along with all of the monohull sailboats anchored nearby, is rolling from side to side. 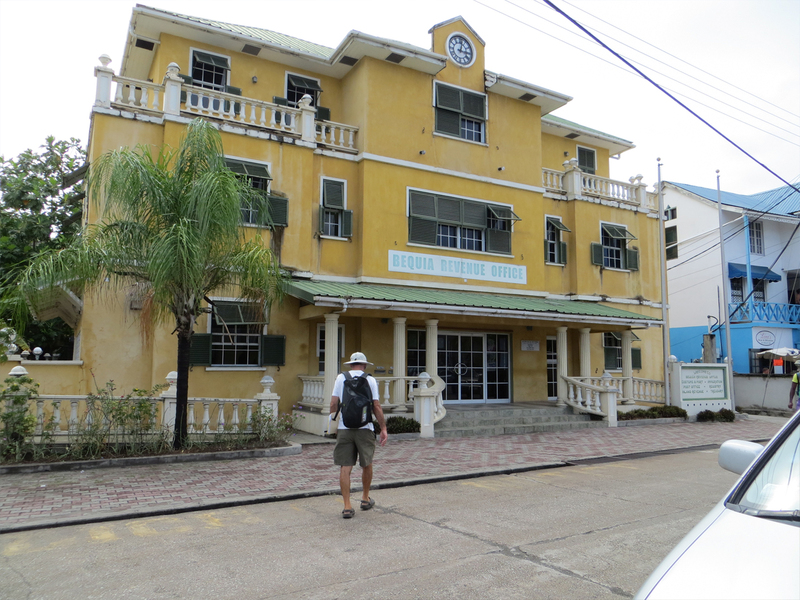 Given the early start to the day, we are ashore in time for the opening of the Customs and Immigration office at 8:30 AM. 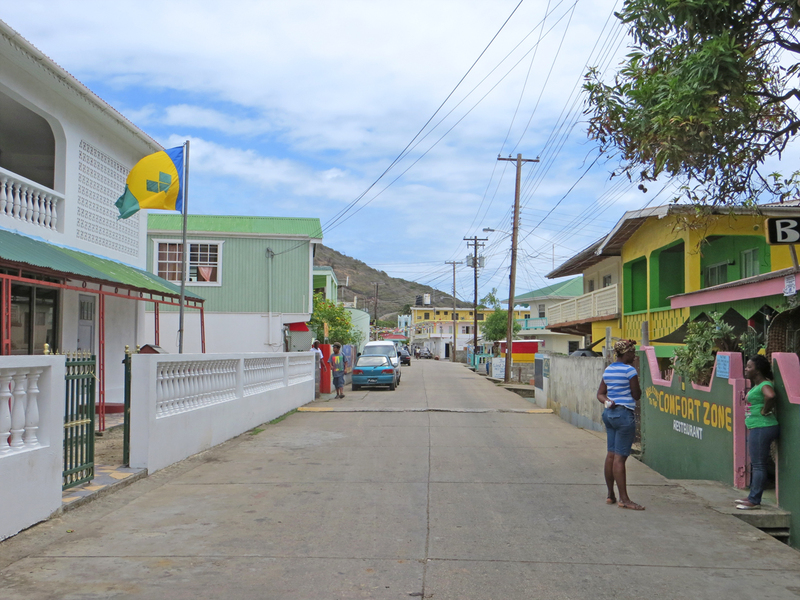 Bequia’s tiny Main Street is already humming when we arrive. The open air market is filled with vendors and customers. Taxi drivers are busy working the crowd at the ferry dock. Even the local Pizza Hut is open for business at this early hour. 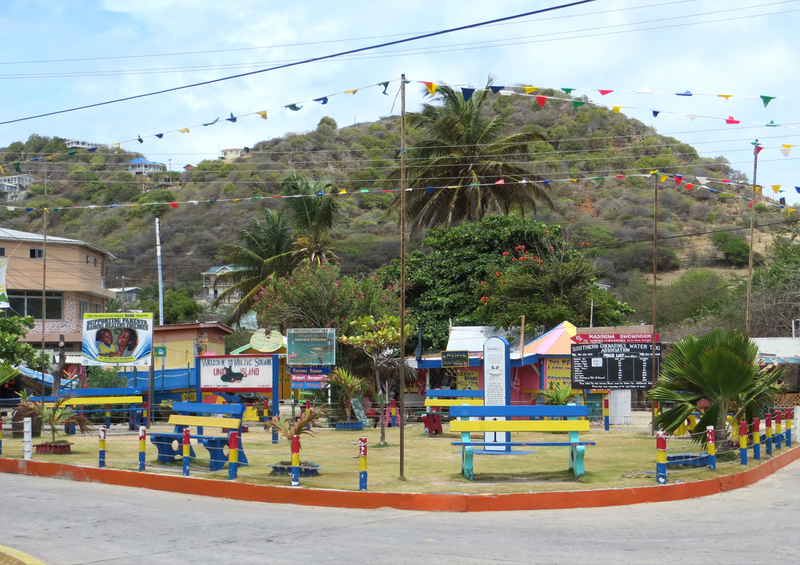 Bequia is the northern gateway to the Grenadines and today is a delightful day for a sail to Tobago Cays, a National Marine Park located 25 miles to the south. Clearance formalities and shopping behind us now, Cutter Loose is underway at 11:30 AM on Monday. 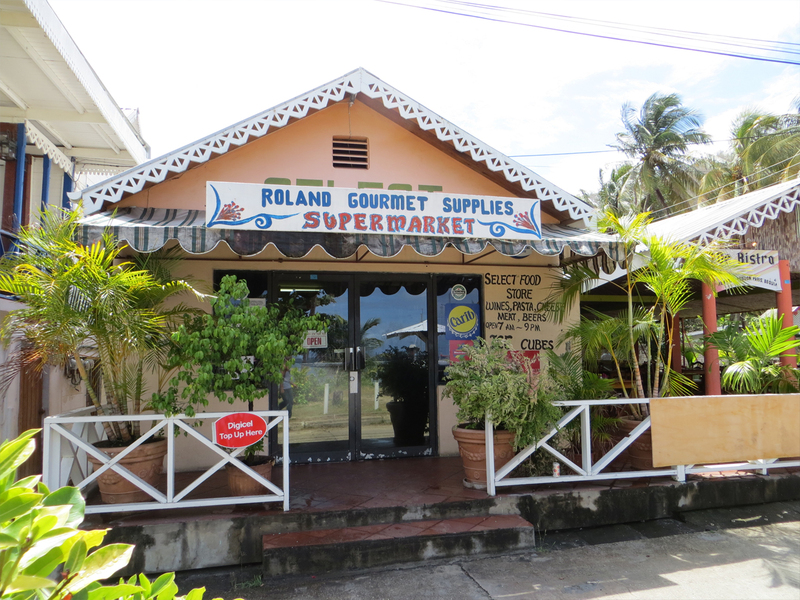 With 20 knot easterlies, it is a lively five hour broad reach past the island of Mustique (home to the rich and famous) and the island of Canouan, home to the Moorings charter boat facility. 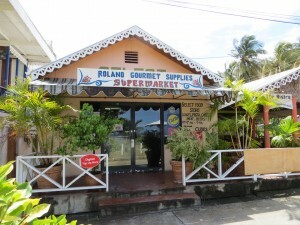 Five miles further south is the island of Mayreau, the closest island to Tobago Cays. Here, the navigation becomes more challenging as several separate islands give the appearance of being joined as one island until they are in close range. Even with the electronic chartplotter, it is quite easy to become temporarily disoriented when attempting to discern which island is which from afar. 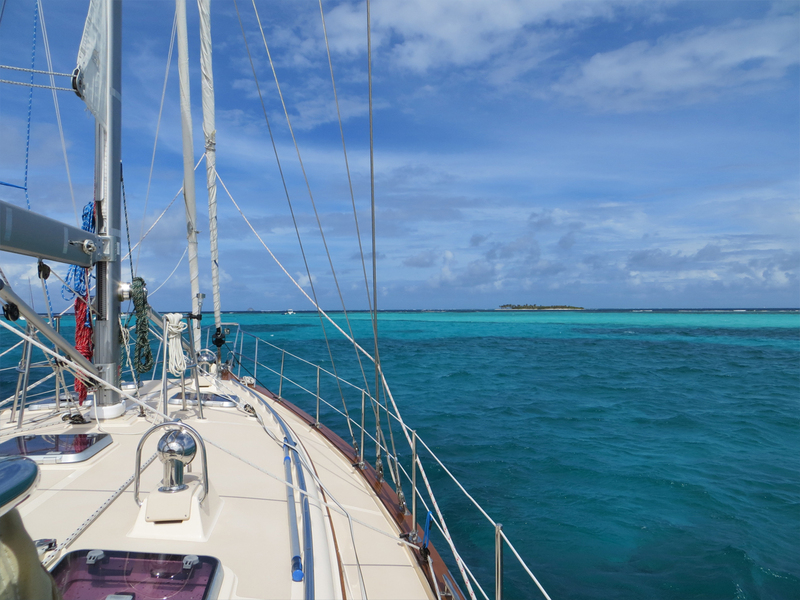 Approaching Mayreau, we pass between waves breaking on Catholic Island and Baleine Rocks, then turn southeast towards the two small uninhabited islands of Petite Rameau to the north and Petit Bateau to the south. Here we enter the National Park. To the immediate east of these islands is Horseshoe Reef where waves crash furiously on the underwater coral. Between Rameau/ Bateau and Horseshoe Reef is a small piece of heaven. Anchoring inside the protection of a reef is an awe inspiring experience. 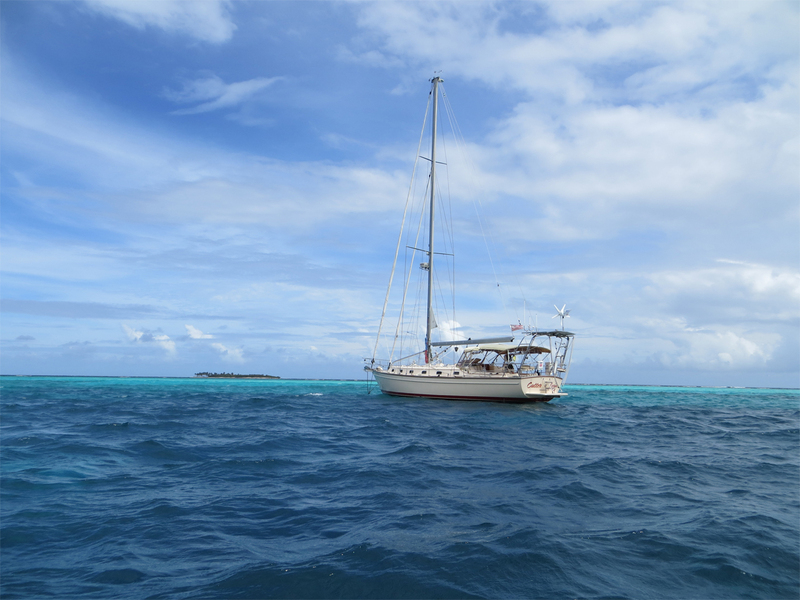 The unimpeded breeze blows steadily at 20 knots, but the water inside the reef remains relatively calm. The constant howl of the wind taken together with the sound of waves crashing on the reef provides nature’s audio entertainment. 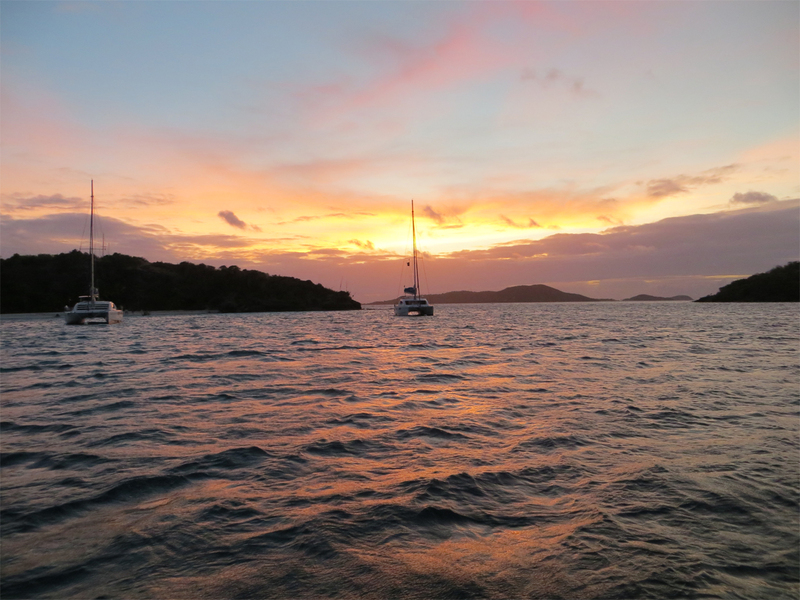 Despite the fact that the daytrippers and charter boats visit here from nearby Union Island and Canouan, the anchorage still seems wild and remote. This is by far the most spectacular anchorage we have experienced during our winter cruise. Regardless of the looming deadline ahead, we will absorb the beauty of this special place for another day. 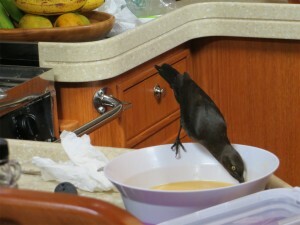 As if to welcome us to Tobago Cays, a feathered friend joins us in the cabin for breakfast on Tuesday. 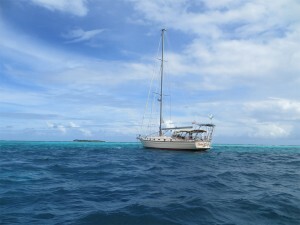 To celebrate our Tobago Cays anchorage, Pat has concocted French toast made with coconut bread. Our guest flutters through the companionway and proceeds directly to the galley where he/she perches on the rim of a bowl containing the leftover egg mixture. All creatures on board Cutter Loose this morning are wildly enthusiastic about Pat’s creation. This afternoon, we snorkel with green sea turtles at the turtle sanctuary near Baradel Island. This area is marked by white floating buoys in order to prevent boats from anchoring in the sanctuary. But in reality, sea turtles are visible throughout the Cays. The turtles graze on underwater sea grass, then rise to the surface every few minutes to replenish their air supply. Most of them have ID tags on their fins. They mow the grass seemingly without regard to human intruders. The water temperature today is perfect for snorkeling. Unlike the Bahamas where the water can be chilly, we have not donned our wetsuits since arriving in the Caribbean. Late in the afternoon, Mr. Quality comes alongside Cutter Loose in his skiff to inquire about our interest in purchasing a custom designed tee shirt. Virtually all of the vendors operate under a nickname or alias, perhaps to create an identity for marketing purposes. 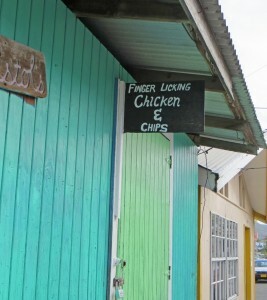 The vendors here in Tobago Cays are not pushy in the least. 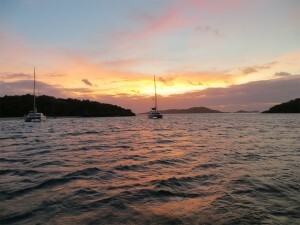 Regrettably, we must leave this lovely setting on Wednesday morning to make southerly progress through the Grenadines. The anchor is up at 8 AM. 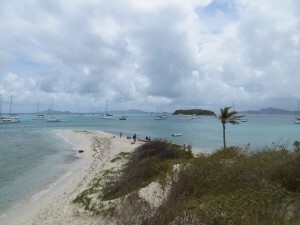 We retrace our steps to Mayreau Island, then turn south towards Union Island and the settlement of Clifton, an official port for customs clearance. This is a tight harbor, filled with anchored and moored boats. A boat boy (actually a grown man) by the name of Tiger approaches us in his skiff as soon as we enter the harbor. He smiles and welcomes us to Clifton and asks if he can lead us to a mooring. He explains that the moorings are free because the town wishes to encourage visitors to return to Clifton. We politely decline Tiger’s offer. The cruising guide warns that moorings in this harbor are substandard. As we circle the anchorage searching for a spot to anchor, Tiger points to an open area near the reef. Once our anchor is down, he maneuvers his skiff alongside Cutter Loose and requests compensation for services rendered. We explain to Tiger that we did not engage his services. Tiger now plays the guilt card, insisting that had it not been for his services, we would not have been able to find a spot to anchor on our own. We politely disagree. Tiger is outraged. Now he is shouting at us. He wants us to believe that some harm could come to Cutter Loose if we do not pony up with some cash. Perhaps his outrage is not an act. Tiger feels strongly that he is entitled to compensation. We agree to pay half of the amount he requested. He takes the money and leaves in a huff. Panhandling and harbor hustling are a way of life here. Just saying a polite “no, thank you” to a panhandler or a taxi driver is generally sufficient to ward off additional solicitation. The boat boys and tour guides, however, are more subtle and persistent in their technique. They spring into action without having been formally engaged, sometimes causing visitors to feel indebted against their will. As a visitor, one can choose to allow the experience of being hustled become a source of frustration. Alternatively, one can accept it as a challenge to extract value from the transaction, to gain insight into the cultural territory and to contribute to the local economy. We now know at the moment of initial contact that, without a doubt, we are about to be swindled. The only question is how the scenario will play out in the end. These scams usually involve just a few dollars. After a while, it becomes a game of chance to see if it is possible to outmaneuver the hustler or escape the con. Admittedly, our success rate at this game is abysmally low. 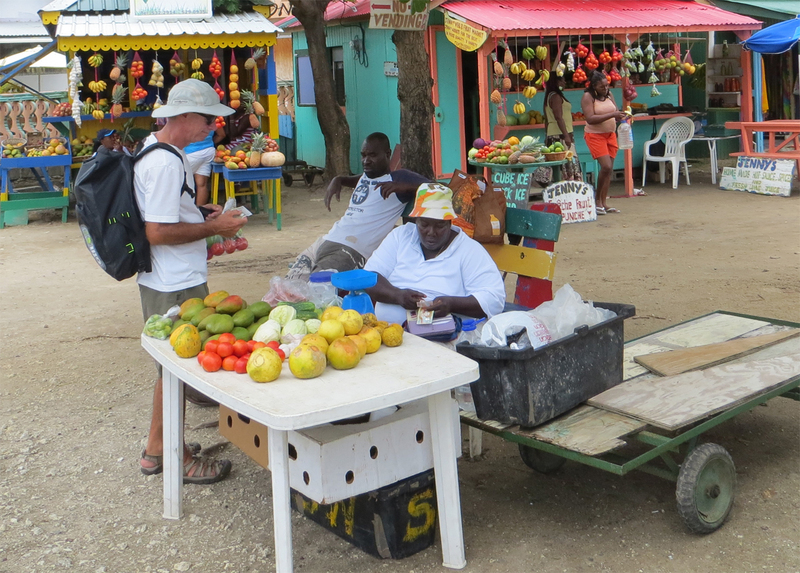 After clearing customs, we take a stroll along the sole street in Clifton, purchasing fruit and vegetables from friendly sidewalk vendors along the way. We always make it a point to spread our meager purchases across several vendors. This village and the people who live here are struggling economically. Other than cruisers calling here to conclude customs formalities, there is little semblance of a tourist economy. The anchor is up in Clifton harbor at 2 PM. Cutter Loose is bound for the island of Carriacou, some 14 miles to the south. 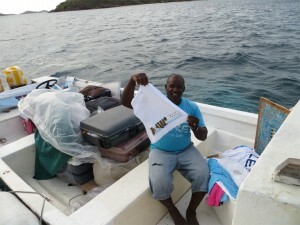 During this leg, we depart St. Vincent and the Grenadines and enter the island nation of Grenada and Carriacou.